The more I experience opera in the new steel and glass pavilion built for Garsington Opera at Wormsley, the more I like it. The space is vaguely reminiscent of the old structure in the grounds of Garsington Manor, but the acoustics are better, the sight lines generous, the sense of carefully designed performance space with technical facilities to match much more tangible. Careful coordination and rehearsal are needed to bring singers and chorus into position from behind and either side of the acting area, but when it works, the effect is stunning. 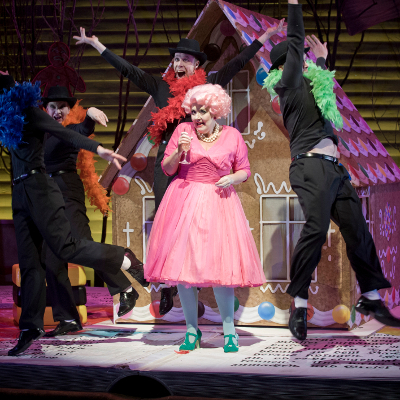 And so it proved that the final chorus in this year’s third and last production, the Hänsel und Gretel of director Olivia Fuchs, was simply wonderful – a life-affirming opera moment as children and adults materialised alike in a sudden tableau that, as it should do, represents real celebration. The audience left on a high. I hadn’t quite seen this coming. For much of the evening Fuchs works the stage with metaphors that are quite dark and depressing, starting with the five mute figures clad in black, who noiselessly manipulate the two principals and the opera’s plot in dumb show that is designed to tell us…what exactly? They lay trails that the children follow, they provide an old-fashioned television set to which Hänsel and Gretel become mindlessly enslaved, they sometimes interact with the principals but for most of the time they seem to be invisible, somewhat malevolent dark forces that are ‘out there’ (and they keep it up during the long interval, prowling silently round the public spaces and frightening the punters!) In Act Two they don grotesque child and animal heads and circle the increasingly frightened and exhausted children, hugely effectively in terms of stage pictures but slightly confusingly in terms of narrative clarity. Who are they, and are they really pulling the strings or are they reacting to a story with a life of its own? We never really get to know the answer. But there is lots of arresting stage imagery along the way. The singing cast provided a strong, well-matched ensemble with one stand-out performance. As father and mother, William Dazeley and Yvonne Howard were well-matched, both with the answer to life’s problems in the form of plenty of cheap booze to hand, both with the requisite tendency to abuse their children. Howard was incisive but never shrill, Dazeley had the vocal authority that the role demands. The cameo roles of the Sandman and Dew Fairy were well taken by Rhiannon Llewellyn and Ruth Jenkins respectively, both projecting attractively but not afraid to sing softly and expressively – which the Garsington acoustic caught perfectly (and full marks to the orchestral accompaniment in both passages). Susan Bickley was luxury casting as the Witch, and sang both strongly and malevolently: there were faint sighs of relief in some quarters as she was despatched into the gingerbread oven! And so to the eponymous principals. Anna Devin made an absolutely dependable, attractively sung Gretel and confirmed the good impression she has been making since her Jette Parker Young Artist days. Her tone is bright – perfect for this part – and her sense of line in the ensemble passages made her always easy and pleasant to listen to. Her diction was good too. But the stand-out vocal performance came from her stage brother, Claudia Huckle as Hänsel. Huckle absolutely nailed the part, singing with a strong, very well-focused mezzo and projecting both her stage and her vocal personality with apparent ease. I do not know if she was this good earlier in the run – I caught the last performance, not only of the production but of the Garsington season – but this was outstanding, truly impressive singing. She is someone to be watched. The Garsington Orchestra was in the dependable hands of Martin André, who paced the score nicely, gave the players and singers room to breathe, and presided over a genial reading of this rewarding music. From 1890, when Humperdinck wrote four childrens’ songs for piano, to 1893 when his full opera was complete, all sorts of composer reference were worked into the orchestration – Wagner of course, in pride of place, but Richard Strauss too (who conducted the first performance of Hänsel und Gretel in Weimar in 1893). So we go from the evocative horn calls that start the evening (beautifully played), through the Wagnerian witches ride, to the beautiful and deceptively simple harmonies of the childrens’ evening prayer and the fourteen angels who are to guard over them. André proved to be alive to all these changing moods and textures, and shaped the melodic contours of this lovely opera with skill and sensitivity, helped by some fine playing, especially in the luminescent quieter passages. A word too for the skilful orchestral elision that allowed Acts One and Two to be played without a break – as with so much in this always interesting production, it felt entirely natural and the onward narrative flow was enhanced. A final word for nature. The stage forest of silvery trees, and the giant pop-up book of fairy tales that provides both parental house (Act One) and Witch’s gingerbread house (Act Three) centre stage were always going to look good once darkness had fallen and stage lighting had begun to work its magic. But actually they looked equally attractive as the rays of the setting sun shone through the enormous plate glass sides of the auditorium, catching the highlights and throwing atmospheric tiny shadows as the evening progressed. On such a summer’s day…the magic was present.